Is A Percentage Based Budget Plan Right For You? Do you struggle with your household budget? Budgeting is hard! I’ve been budgeting for years and still struggle to get it right each month. If you are struggling to manage your family household budget, you should consider giving the percentage-based budgeting system a try. The percentage-based budget is one of the easiest budgeting systems to implement. I’ve used all types of budgeting methods at various times in my life. Some have worked better than others, this is one of the winners. The basis of my current budget is the 50/30/20 percentage based budget method. The 50/30/20 budget plan allows for more flexibility and freedom and doesn’t require as much tracking as a typical household budget. However, its simplicity can cause issues if you aren’t budgeting properly. The lack of tracking can make it easy to hide spending problems. It doesn’t require the same level of self-control. Many people find they spend more money when using a percentage based budget. If you are working on debt reduction and have issues with spending, I recommend the standard zero-based budgeting system. The percentage budget is best used when you have a clear understanding of the differences between your wants and needs. The biggest program is learning to differentiate your wants and your needs. Your basic needs are tied to food and shelter, once you have those items taken care of then you build from there. For example, my basic food budget is typically around $300-325 right now. When I’m eating healthier or hosting BBQ’s my numbers increase. That increase is a want, but the basic food budget is a need. This portion of my income goes towards all of my fixed expenses and a portion of my discretionary expenses. If you have consumer debt (cars, credit cards, student loans) then your minimum payments for each loan should be included in this area. This portion of the 50/30/20 budget plan is for all of your bills and expenses that must be paid each month. This portion of my income is devoted to the fun things in life, the little extras that make life a bit more enjoyable. You get the idea, this is the fun category. This is where you really need to understand the difference between a want and a need. For example, some form of a phone is a need, but a fancy smartphone is typically considered a want. I went into a lot more detail on how to determine wants and needs in one of my most popular posts. Want or Need, how to control your spending. I do my best to keep this percentage as low as possible since any extra can go towards my savings goals. I buy virtually all of my clothing through ThredUp, I focus on Meal Planning and avoid eating out. I do all of the little things that I can to save a bit of extra money as a stay at home mom. This portion of my income goes to savings and investing. This is the part I love. I’m just nerdy enough to love the investment side of the equation. We split the 20% between retirement accounts, college funds, and a new vehicle fund. Obviously, your savings needs may be different. If you don’t have an emergency fund, I recommend starting there and then adding to the additional savings accounts. I’m a very, very firm believer in saving, I’m even more of a believer in an emergency fund. If you are just starting out, save $1,000 as a starter emergency fund. If you are consumer debt free, I recommend 3-6 months of savings. If you are struggling to save money, I highly recommend checking out Digit. I seriously love this money saving program. 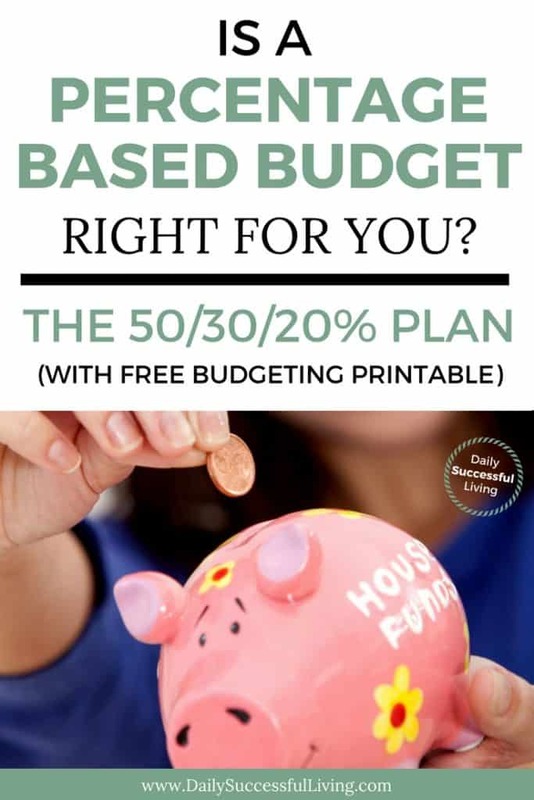 The 50/30/20 budget is the easiest budget to manage in my opinion. It is simple, straightforward and quick to set up. The lack of category tracking saves time and makes it easier to stay within the guidelines. Using a percentage based budget allows for a certain level of freedom that traditional budgets don’t include. It is easy to adjust the percentages based on your individual needs and financial situation. However, that freedom can be dangerous if you aren’t managing your money properly and paying attention. If you choose to use this budget, don’t be surprised if your spending increases. I’m not a perfected budgeter, I’ve made tons of mistakes over the years and through trial and error finally found a budget that works for us. Aaron’s salary is partially commission based. I use my part-time salary and his base salary to pay our basic living expenses using the 50/30/20 percentage method and then the irregular budget to fund the extra wants and saving needs. I don’t think the type of household budgeting system you use matters as much as the fact that you are actively using a budget. I’ve found that when I use a budget I make significantly better financial decisions. I pay more attention to my money and am more responsible for my spending. You are also welcome to download my 50/30/20 budget template. It is a simple one-page form that will make the budgeting process even easier. Thank you so much for this post! I recently started this method and love it!!! Yeah! I’m glad it worked for you.